I can't resist a bit of stitcherly experimentation, apparently. I was reading crochet and saw a question from someone who wanted to reverse engineer a crochet motif so she could make another one. The answers all had some similarities (make a stitch into a space in the previous row, then chain one, and make a stitch in the next space, repeat that along the sides, and oh, each corner space gets a (stitch, ch1, stitch cluster), but they also agreed that the stitch was either double or half double (US terminology: everyone else, read that as "treble or half treble"). I disagreed. It looked like US single/UK double to me. 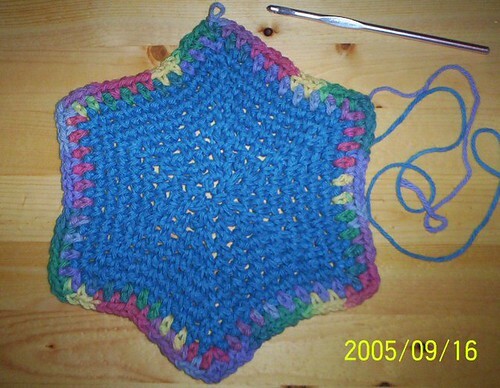 I spent several hours last evening crocheting a pot-holder size hexagonal motif. Yes, it's pretty, and yes, I demonstrated to my own satisfaction that the stitch used was US single/UK double, but darn it, it would have been nice to get more than three hours sleep last night. Ah, well. I'm nuts. I'll just have to live with that.